During a presidential cycle in which the mainstream media and political class has used frustratingly neutral language to describe the deep-seated prejudice fueling Donald Trump’s presidential bid, Jimmy Carter—a 91-year-old, white Baptist deacon from the reddest part of the South—has decided to do the exact opposite. 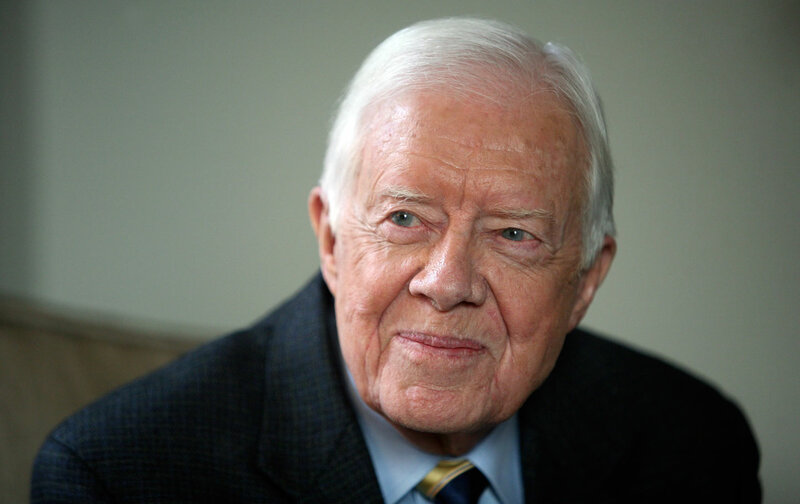 Carter, who is still receiving treatment for his nearly year-old cancer diagnosis, unapologetically told The New York Times Monday that Trump’s campaign has “tapped a waiting reservoir of racism” contrary to “basic human rights.” In typical Carter style, he not only named the problem, but has thrown himself into the fray of trying to solve it, calling for a summit of his New Baptist Covenant project to unite members of that denomination into a transracial effort to fight hatred. The fact that his frank words and call to action have sparked dozens of headlines and set the blogosphere alight for days tells us a lot about just how far down the rabbit hole America has gone on race recently. President Obama’s term was characterized initially as “post racial.” Yet there’s something about the present that’s clearly all too familiar to Carter, who spent half of his life uncomfortably at the very top of America’s racial caste system in the segregated South, but who devoted the second half of it to tearing that system down. And it’s not only the press. Neither President Obama, nor Hillary Clinton, nor Bernie Sanders has bluntly called out Trump as a racist in the way Carter is doing. When asked explicitly by The Washington Post’s Karen Tumulty during the March 9 presidential debate, “Is Donald Trump racist?” both Democratic candidates refused to say yes. President Obama mocks Trump’s racism without explicitly naming it. But former President Carter isn’t waiting for the political elite or the media to get it together. That’s not a surprise. When it comes to racism and white supremacy, Carter’s always been an anomaly. Jimmy Carter grew up in a prominent family in Southwest Georgia in a town called Plains. The name of the place is also an accurate description of it: a rural part of a conservative state dominated even now, as during Carter’s boyhood, by peanuts, pecans, and cotton. Carter’s early world was essentially divided between landowners and land workers; those in the latter group were the descendants of slaves and sharecroppers. As the scion of a local prominent peanut family, Carter was firmly and undoubtedly in the racial ruling class. When it comes to racism and white supremacy, Carter’s always been an anomaly. But something about his role in the legacy of America’s original sin of inequity never quite fit with Carter. Rather, his life is more a product of his own moral character made right in spite of the undertow from the nation’s powerful racial tides. My family’s ancestral home is a 20-minute drive from Plains. The places where my parents, grandparents, great-grandparents, and great-great grandparents spent their lives form a physical arc with Jimmy Carter’s hometown. As a Southern, rural black family we were as much at the bottom of the racial hierarchy as Carter’s family was at the top. Typically, this dichotomy between the planter class and everyone else meant that when a name like that of someone belonging to a clan like the Carters came up at our family gatherings, it was met with either stony silence or outright disdain. But in my grandparents’ house, Carter’s name was literally whispered with reverence. He ranked up there after only Jesus and my grandfather’s grandmother Betty, who was born in slavery, lost her right hand in a cotton gin at age 5, was operated on by her uncle on the plantation, and somehow went on to eke out enough money from a lifetime of sharecropping to buy a small plot on which future generations were born, raised, and would die. We were not the Carters. In fact, we were a nettlesome black family to white authorities. My grandfather had a reputation as “crazy” to local police because he would threaten them in broad daylight when he felt crossed, despite the fact that Martin Luther King Jr. labeled the county “Terrible Terrell,” for its intense anti-black violence. On a few occasions when my father came home after sundown from SNCC meetings, he made his way on foot through pecan groves in order to avoid being picked up by law enforcement on the open road. On those nights, my grandfather waited on the porch for him with a shotgun. They had a special signal in case he was being chased by the Ku Klux Klan. But somehow, against this backdrop of a wrenching place with contested people in contested space, my family developed genuine affection for Jimmy Carter—someone seemingly their exact opposite. It’s only as an adult that I understand why. Upon taking over the Carter family peanut business after the death of his own father, Carter was pressed to join the local White Citizens Council. White Citizens Councils were the political arm of the Klan. Carter declined. He was the only member of the Sumter County ruling class to do so, and as a result he was boycotted. In the 1960s when Carter’s church voted against desegregating itself, two of the three dissenting votes came from Jimmy and Rosalyn Carter. However, Carter’s efforts on race—like those of the broader nation, even at its best—are neither unblemished nor linear. While running for Georgia governor in 1970, he appealed to segregationists for their support, cozying up to former axe-wielding governor Lester Maddox, the state’s version of the infamous George Wallace of Alabama. Maddox both used and handed out axe handles to whites in order to block African Americans from entering commercial spaces. Carter’s solicitation of Maddox is clearly a low point. After sweeping to electoral victory, however, Carter swung back to his more authentic self. On inauguration day he declared in his first speech as governor that “the time for racial discrimination was over” and he never looked back, eventually increasing the number of blacks in Georgia’s government by 25 percent. As a result he had a contentious relationship throughout his tenure with Georgia’s diehard legislature. Yet with the bigger stage of the presidency came even greater actions on race. Carter brought more people of color and women into the executive branch than any other president in history up that point. His impact was especially felt in the number of African Americans appointed to the federal bench. Papers from his special assistant for black affairs show a relentless focus on black small businesses, access to credit for rural blacks (the poorest of the poor), and an overall opening of the doors of government economic programs to people of color. Carter appointed the first black woman ever to serve in the cabinet, Patricia Harris, as secretary of Housing and Urban Development, as well as Martin Luther King’s former deputy Andrew Young as ambassador to the United Nations. Carter’s fight against injustice didn’t stop at America’s shores. In one of the most controversial moves of his presidency, Carter campaigned to return the Panama Canal to Panama. His argument was made explicitly on anticolonial grounds for that black and brown nation. In an address to the American people he reminded Americans that the original Panama Canal Treaty “was not signed by any Panamanian.” In fact, the UnitedStates sponsored the creation of Panama solely to seize land, build the canal, and hold it. Carter won the right to place the Panama Canal into Panamanian possession by just two votes in the Senate. Ronald Reagan held the “loss” of the canal over Carter’s head two years later in his race against him. Additionally, Carter laid everything on the line to partner and pressure black Egyptian leader Anwar Sadat to make peace with Israel, eliminating what had been one of the most dangerous flashpoints in the world. What’s interesting about the Carter legacy is that, despite its dismissal and denigration by the mainstream media and political class, it formed the model for action on race at home and abroad that’s been followed by each subsequent Democratic president. Bill Clinton, who explicitly patterned much of his time as governor of Arkansas on Jimmy Carter, broke his predecessor’s record and appointed more people of color in Executive Branch positions than any other president to that point, with a historic number of black and Latino cabinet members. Through a mix of policies and timing—laying aside the controversy over the racial implications of the 1994 Crime Bill—Clinton’s presidency was the only one in the last five decades where the gap in income and wealth between blacks and whites closed. And like Carter, Clinton negotiated peace in the Middle East in 1994 between Israel and Jordan. At the end of his presidency he attempted to do the same, though unsuccessfully, between Israel and the Palestinians. President Obama is the latest to continue with the Carter legacy of appointments, creating what for now stands as the new record for people of color named to both the executive and judicial branches of government, but extending it as well to women and members of the LGBTQ community. His signature domestic achievement, the Affordable Care Act, disproportionately impacts people of color and has cut uninsured rates in black and brown communities by half. Outside of the United States, Obama’s opening to mostly black Cuba—where six in 10 residents are of African descent—on grounds that the embargo was inconsistent with American values is right out of Carter’s playbook. So is the Iran nuclear deal. On top of it all, Carter’s post-presidential focus on poor black and brown places around the world is well known and exemplary, leading to his receipt of the Nobel Peace Prize in 2002. Yet despite many of these achievements since the end of the Carter presidency, the fact that Carter himself felt the need to come out of cancer recovery and issue a clarion call on race is deeply worrying. A man brought up during some of the nation’s darkest times, whose early existence was predicated on rank inequity, who then worked to make many of the changes now under assault, has told us to wake up—because we’re backsliding. The reality that this hasn’t been done effectively or consistently by those younger than Carter, those who now have the microphones and the power to impact events, is equally worrying. The good news is that America still has Jimmy Carter to help bring us to our senses when we most need it. Imara JonesTwitterImara Jones is a writer whose upcoming news program “The Last Sip” is in development with FSTV.